Veolia Transdev’s Sydney operation is claiming top spot in commuter confidence based around its southern services following the recent release of the NSW Government’s customer satisfaction report. The report surveyed more than 6,000 Sydney bus commuters across the 15 metropolitan bus contract regions, four of which are operated by Veolia Transdev – south, south-east, mid-west and North Shore regions. The first and second most satisfied regions are serviced by Veolia Transdev, being the south-east with 94 percent customer satisfaction and the south with 92 percent satisfaction. Based on data from the report, Veolia Transport NSW Managing Director Morris Caputi says the operator’s customers were up to 8 percent more satisfied than the average Sydney bus commuter. He says the survey results are proof that the private-public partnership model works, but are not a sign that that the operator can rest on its laurels. "It’s gratifying to see that the effort we’re putting in to improve our bus services has resulted in some of the most satisfied bus users in Sydney," Caputi says. "But we’re still focussed on initiatives that will take our operations to the next level, particularly in areas of information, convenience and accessibility." 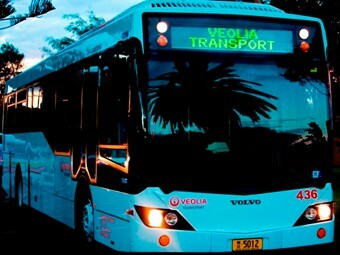 Veolia Transdev Australasia CEO Jonathan Metcalfe says urban bus contracts are the operator’s ‘bread and butter’. "We’re pleased that this is being reflected in these customer satisfaction results," he says.